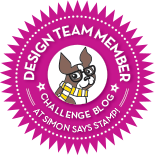 I am just in love with the Simon and Dexter stamp sets from Simon Says Stamp! Playing on a quiet Sunday in my office/craftroom and my Monday and Tuesday trip to Quebec City has been cancelled! Very happy about this, therefore no need to run crazy errands and pack! 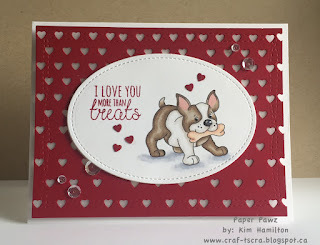 This card will go to my husband from our pets on Valentine's Day!